Mention the Tournament of Champions (ToC) to an RC Aerobatics enthusiast and it conjures memories of the best of the best. The lights and sounds of Las Vegas, desert winds, ground-breaking freestyle maneuvers; the top aerobatics pilots in the world laying it on the line for a top cash prize of $5000.00 in 1974, which grew to $40,000 in the contest’s final editions. Sadly, the ToC faded into the desert sunset with the final contest in 2002. While the ToC may be gone, its spirit thrives in a picturesque corner of western Tennessee. In 1960, an aero-modeling enthusiast by the name of Walt Schroder assumed the editor’s duties at Model Airplane News. During the decade that Walt held that post model aviation underwent dramatic advancements with respect to the technology available to the modeler. Model Airplane News, under the guidance of Walt, was a forerunner in the process of helping modelers adapt to the rapidly changing technological landscape in the RC world. Walt left the editor’s post in 1970 to take the reins of MAN as president and publisher. During his tenure as president, he, Bill Bennett, owner of the Circus Circus Casino and Hotel, and Art Schroeder, Walt’s successor as editor, conceived the now famous Tournament of Champions. Their idea was to invite the top 20 fliers in the world to compete in an aerobatics contest for cash and prestige in Las Vegas. The first ToC was held in 1974 and featured such renowned pilots as Hanno Prettner - who won that inaugural ToC, and 7 more – Dave Brown, Ivan Kristensen, and Wolfgang Matt. The ToC continued through 18 editions over 29 years, during which time it was a driving force behind the technological advancements and evolved flying techniques that exist in today’s Giant Scale aerobatics. The ToC pilot’s list is a veritable hall of fame in the international model aviation community. - Used his personal and business finances to support and promote model aviation, frequently discounting rooms to model aviation competitors staying in his hotel during competitions. - Created the North Las Vegas model airport - did an architectural study to position the runway to be in the prevailing wind and at no time have the sun in the eyes of the pilots. - Never expected material gain, either to himself or the hotels, as in each case it was at a great cost of many dollars just to do these many things. Never did he or the hotel ever expect anything other than financial losses due to these many contributions to further our hobby. - His financial contributions added a new dimension to the competitive section of our hobby/sport as we now have a professional category of miniature aircraft pilot. - The new TOC pattern maneuvers were adopted in many countries and became part of the organized international competition by becoming part of the FAI schedule of pattern maneuvers. The curtain dropped on the final ToC in 2002, leaving a void in the Scale Aerobatics world. Thanks to visionaries such as Dave Johnson and Pat Hartness, the Tucson Aerobatic Shootout and the Don Lowe Masters helped to fill that hole. With the demise of the Masters in 2006, the time was ripe for another of the hobby’s visionaries to step in and allow the spirit of the ToC to once again flourish. Growing up the son of Walt Schroder, one cannot be surprised that John Schroder would inherit the passion and vision for RC that he exhibits today. The apples don’t fall far from that tree. John not only continues his father’s zeal for RC aviation, but carries on the tradition of giving back to the RC community in much the same tradition established by his father and Bill Bennett. John has tirelessly devoted his time and personal resources to the advancement of our hobby. He concentrates on the youth of the hobby and offers support to anyone whenever he can. John has been instrumental in helping the International Miniature Aircraft Club (IMAC) achieve the status it holds today. When John retired in 2007, his desire for the ToC to live on became a driving focus of his life. He and his wife Tina began to search for a location that could support such an endeavor. If you have never heard of Toone, Tennessee, you’re not alone. It was unknown to the vast majority of the model aviation world until John moved to town and went straight to work on his new-to-him 200-plus acre sod farm. Much as Bill Bennett did for the TOC, John laid out a facility where the sun and prevailing winds are not limiting factors for the pilot. He built an air-conditioned hanger on the flight line for aircraft maintenance and storage and groomed a runway that would make the Augusta National grounds keepers envious. A few months after putting down roots, it was ready. John christened his slice of paradise by continuing a custom he established in Florida: IMAC Summer School and NATS warm-up. Each summer John and Tina open their doors for students on summer break to come and engage in some intense IMAC practice and coaching. In return the students learn some real-life skills by working the farm to help with upkeep. In 2008, just like his father Walt and Bill Bennett, John invited the world’s best pilots to an international aerobatics championship that rekindled the spirit of the ToC. 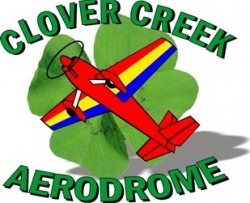 The inaugural Clover Creek Invitational set a new standard in the world of RC Aerobatics. John opened his private residence for nothing more than the enjoyment of his fellow RC enthusiasts. His desire was to promote the art of precision aerobatics to its fullest, share his passion for model aviation, and see competitors from around the world unite and compete for prestige and cash. The 2010 and 2012 Clover Creek Invitational continued the tradition with 20 of the world’s best again invited to battle for $50,000 worth of prize money! In another selfless act that reflects his father and Bill Bennett, John has once again funded the $50,000 prize list from his personal resources. The Clover Creek Aerodrome and the Clover Creek Invitational are just the latest of a number of selfless acts made to the RC community by John Schroder. If you have not had the pleasure of meeting John, hopefully you will take the chance this year to visit his spectacular facility, witness world class pilots testing their mettle, and shake the hand of a man who has given more to the hobby than can be measured or described. We welcome the world of model aviation to Toone, Tennessee for the 2010 Clover Creek Invitational, and hope that you will be a part of an event that will carry forward the tradition established by Bill Bennett, Art Schroeder, and Walt Schroder.